The ancient city of Lystra is located in central Turkey today. A few pictures of the site can be found in Volume 9 of the Pictorial Library of Bible Lands. It was a mainly market town and, as can be surmised from this passage, it contained a temple to Zeus. However, our picture of the day comes from Volume 10 of the revised and expanded edition of the PLBL, which focuses on Western Turkey. 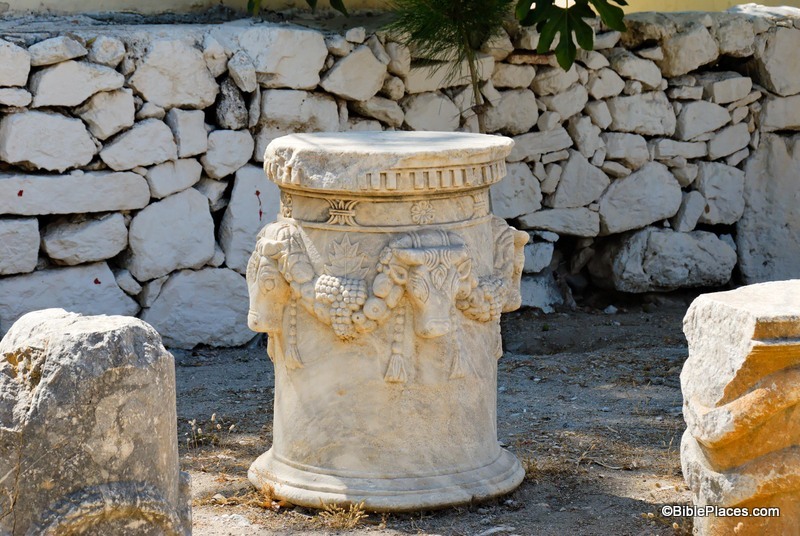 The photo is entitled "Cnidus Architectural Fragments, Bull with Garlands" (photo ID #: tb062206733). This picture illustrates verse 13 (in bold above) which mentions the priest of Zeus bringing "oxen and garlands" so that he could offer sacrifice. This seems to have been a common practice, not only in Lystra but in several other places as well. Several carvings of bulls with garlands have been found in this region of the world. The picture above is one example of this common architectural motif. (Click on the picture for a higher resolution.) This object was found at Cnidus, a city on the western edge of modern Turkey. It is a fragment of a decorative pillar depicting a bull's head on each side. The heads are connected by a garland, and tassels can be seen hanging down on either side of each bull's head. Within the garland are clusters of grapes and possibly some other fruit. "Pisidian Antioch stone with bull and garlands, tb010201834"
"Cnidus architectural fragments, bull with garlands, tb062206733"
"Ephesus fragment with bull and garlands, tb041405323"
"Samos Pythagorio Roman baths fragment with bull and garlands, tb061606256"
Little insights from archaeology such as this can add interest to the retelling of a familiar story and grab the listener's attention. Over the last few generations, many societies in the world (including the U.S.) have become extremely visually oriented. Whether it watching television, going to the movies, or surfing the Internet, much of what people do today is visual. Pastors and teachers should seek to meet people where they are and use multimedia resources to their advantage to communicate their message. And similar to Paul and Barnabas, we need to make every effort that our message is not misunderstood. This and other photos of the Cnidus are included in Volume 10 of the Pictorial Library of Bible Lands and can be purchased here. More information and a photo of Lystra can be found on the BiblePlaces website here.